The one-meter focal length Model 248/310 is a grazing incidence monochromator built in the Rowland circle configuration. It is a compact and versatile instrument useful from one to 310 nanometers and best for wavelengths shorter than 100 nm (greater than 12 eV). Grazing angles improve reflective efficiency. Moving the exit slit or other detector along the Rowland circle, a circle with Diameter equal to the diffraction gratings Radius, insures best focus and spectral resolution at the wavelength of interest. 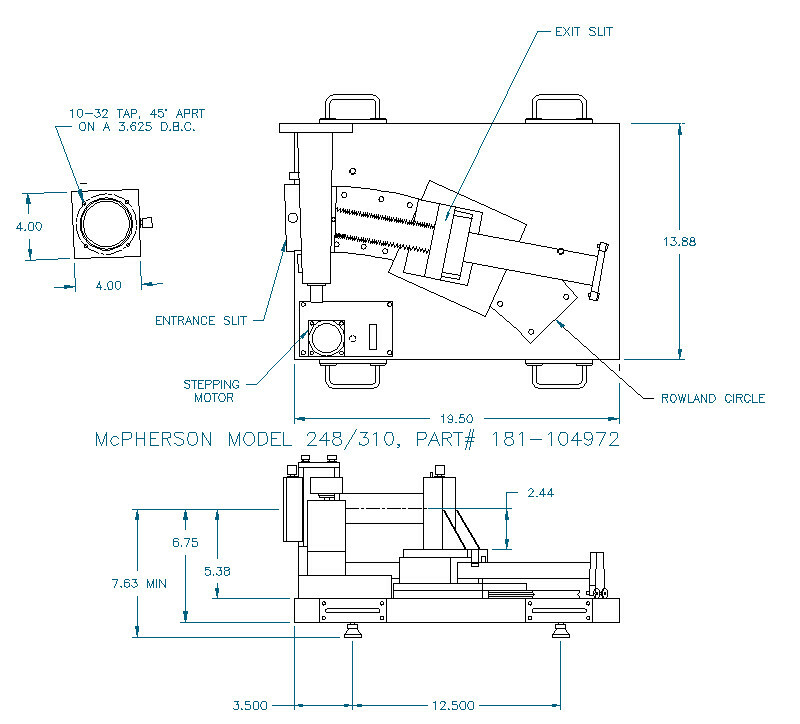 The Model 248/310 is available in several different configurations: as a scanning monochromator, with a direct-detection CCD, with a tangential microchannel plate intensifier, or in reverse, as a variable source of XUV and soft x-ray emission. All versions are available for high vacuum or optionally Ultra High Vacuum (UHV) with metal seals. It is well equipped with adjustable slits, in vacuum grating-focus adjustment, high precision wavelength drive, and filter insertion slide. This instrument may be built with angle of incidence 84 to 88 degrees depending on the application. Slits Continuously variable micrometer actuated width 0.01 to 0.5 mm. Settable height. The McPherson Grazing Incidence instrument can be configured to suit an application or experimental requirement. To diagnose transient plasmas the user may need to collect a range of data quickly and possibly with good time resolution. This instrument is equipped with a microchannel plate intensifier with gating capabilities. To monitor a narrow region of spectra (e.g. 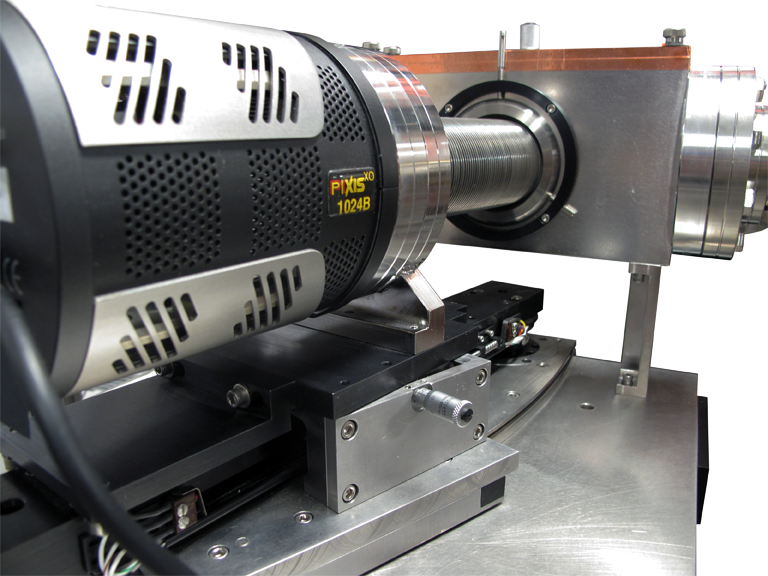 FEL, HHG x-ray laser) a CCD can be used for high resolution direct detection. CCD readout requires longer time scales but they provide excellent sensitivity and range. For material testing reflectance / transmittance or calibration in the soft x-ray and extreme UV the 248/310 can be set up in reverse, to scan sources and deliver specific wavelengths to samples or devices under test. Abstract: Since 1998, the interaction of precision spectroscopy and ultrafast laser science has led to several notable accomplishments. Femtosecond laser optical frequency 'combs' (evenly spaced spectral lines) have revolutionized the measurement of optical frequencies and enabled optical atomic clocks. The same comb techniques have been used to control the waveform of ultrafast laser pulses, which permitted the generation of single attosecond pulses, and have been used in a recently demonstrated 'oscilloscope' for light waves. Here we demonstrate intra-cavity high harmonic generation in the extreme ultraviolet, which promises to lead to another joint frontier of precision spectroscopy and ultrafast science. We have generated coherent extreme ultraviolet radiation at a repetition frequency of more than 100 MHz, a 1,000-fold improvement over previous experiments. At such a repetition rate, the mode spacing of the frequency comb, which is expected to survive the high harmonic generation process, is large enough for high resolution spectroscopy. Additionally, there may be many other applications of such a quasi-continuous compact and coherent extreme ultraviolet source, including extreme ultraviolet holography, microscopy, nanolithography and X-ray atomic clocks. Abstract: In this paper the influence of the prepulse current on a capillary-discharge 46.9 nm Ne-like Ar extreme-ultraviolet laser is reported. A current pulse with a typical RC shape (decay time of ~30 μs) was used as a prepulse. Measurements indicate that when the filling pressure is low, the output can be improved by reducing the time delay between the application of the prepulse current and the onset of the main discharge current. For high pressure the reverse is true. This change is most significant for time delays between 2 and 4 μs, and beyond these time delays, the effect is less significant. This effect is attributed to the changes in the capillary channel pressure and also to the absorption of the laser emission by the plasma plume ejected during the prepulse. Thus, apart from ensuring a minimal amount of prepulse current to prevent nonuniformity effects, the timing of the application of the prepulse current is also important. Abstract: We report, for the first time, the generation of high-order harmonics in a spectral range between 200 eV and 1 keV with an unusual spectral property: only every 4th (4i + 1, i∈ℵ) harmonic line appears, whereas the usual high-harmonic spectra consist of every odd (2i + 1) harmonic. We attribute this unique property to the quantum path interference of two extended electron trajectories that experience multiple re-scattering. In the well-established theory, electrons emitted via tunnel ionisation are accelerated by a laser field, return to the ion and recombine. The acceleration typically lasts for less than one optical cycle, and the electrons radiate in the extreme ultraviolet range at recombination. In contrast, for extended trajectories, electrons are accelerated over two or more optical cycles. Here, we demonstrate that two sets of trajectories dominate and provide substantial contributions to the generated soft X-ray radiation because they fulfil the resonance condition for X-ray parametric amplification. Abstract: Manipulation of electron dynamics calls for electromagnetic forces that can be confined to and controlled over sub-femtosecond time intervals. Tailored transients of light fields can provide these forces. We report on the generation of subcycle field transients spanning the infrared, visible, and ultraviolet frequency regimes with a 1.5-octave three-channel optical field synthesizer and their attosecond sampling. To demonstrate applicability, we field-ionized krypton atoms within a single wave crest and launched a valence-shell electron wavepacket with a well-defined initial phase. Half-cycle field excitation and attosecond probing revealed fine details of atomic-scale electron motion, such as the instantaneous rate of tunneling, the initial charge distribution of a valence-shell wavepacket, the attosecond dynamic shift (instantaneous ac Stark shift) of its energy levels, and its few-femtosecond coherent oscillations. Abstract: The calibration of a McPherson’s fully computer-controlled grazing-incidence spectrograph Model 248/310G (Rowland circle diameter ≈ 1 m) with a MCP/CCD detection system is described. As a DC source of the XUV radiation served the Vacuum UV Hollow Cathode Light Source (McPherson Model 629), which was delivered together with the spectrograph. We concentrated on the MCP-centre- as well as across-MCP-wavelength calibration (a more general theoretical relation than in  was found), MCP gain uniformity, and CCD binning linearity. No attention was paid to a resolution of the system, because it changes with the wavelengths and it is determined by properties of the detection system. In general, it is usually much worse than the resolution of the spectrograph itself. Abstract: Coherent soft-x-ray radiation up to photon energies of 700 eV is obtained by focusing several-mJ, 10-fs near infrared laser pulses into a He gas jet. The observed nearly constant photon yield over several hundred eVs may be attributed to nonadiabatic self-phase matching, originating from a substantial ionization within a fraction of the optical cycle of the driving laser pulse. 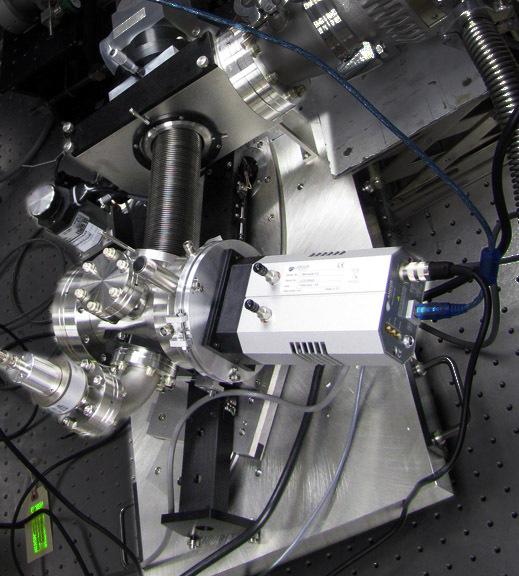 Abstract: The high resolution camera (HRC) is one of AXAF's two focal plane instruments. It consists of two detectors: the HRC-I which is optimized for direct imaging of x-ray sources; and the HRC-S which is optimized as the spectroscopic read-out of the low energy transmission grating (LETG). Both detectors are comprised of a chevron pair of micro-channel plates (MCPs) with a crossed grid charge detector (CGCD) and a UV/ion shield (UVIS). The role of the UVIS is to minimize the detectors' sensitivity to low energy electrons, ions and UV light, while providing sufficient x-ray transmission in the 0.1 to 10 keV x-ray band. In this paper, we report on the results of the flight UVIS calibration measurements. Specifically, x-ray and UV transmission measurements obtained at the HRC X-ray Test Facility of the Smithsonian Astropysical Observatory, and x- ray transmission measurements of UVIS witness samples obtained at a synchrotron light source facility. Abstract: High-order harmonic generation (HHG) from atoms and molecules offers potential application as a coherent ultrashort radiation source in the extreme ultraviolet and soft X-ray regions. In the three-step model of HHG, an electron tunnels out from the atom and may recombine with the parent ion (emitting a high-energy photon) after undergoing laser-driven motion in the continuum. Aligned molecules can be used to study quantum phenomena in HHG associated with molecular symmetries; in particular, simultaneous observations of both ion yields and harmonic signals under the same conditions serve to disentangle the contributions from the ionization and recombination processes. Here we report evidence for quantum interference of electron de Broglie waves in the recombination process of HHG from aligned CO2 molecules. The interference takes place within a single molecule and within one optical cycle. Characteristic modulation patterns of the harmonic signals measured as a function of the pump-probe delay are explained with simple formulae determined by the valence orbital of the molecules. We propose that simultaneous observations of both ion yields and harmonic signals can serve as a new route to probe the instantaneous structure of molecular systems. Abstract: Significant progress in high repetition rate ultrashort pulse sources based on fiber technology is presented. These systems enable operation at a high repetition rate of up to 500 kHz and high average power in the extreme ultraviolet wavelength range via high harmonic generation in a gas jet. High average power few-cycle pulses of a fiber amplifier pumped optical parametric chirped pulse amplifier are used to produce μW level average power for the strongest harmonic at 42.9 nm at a repetition rate of 96 kHz. Abstract: The synthesis of isolated attosecond pulses (IAPs) in the extreme ultraviolet (XUV) spectral region has opened up the shortest time scales for time-resolved studies. It relies on the generation of high-order harmonics (HHG) from high-power few-cycle infrared (IR) laser pulses. Here we explore experimentally a new and simple route to IAP generation directly from 35fs IR pulses that undergo filamentation in argon. 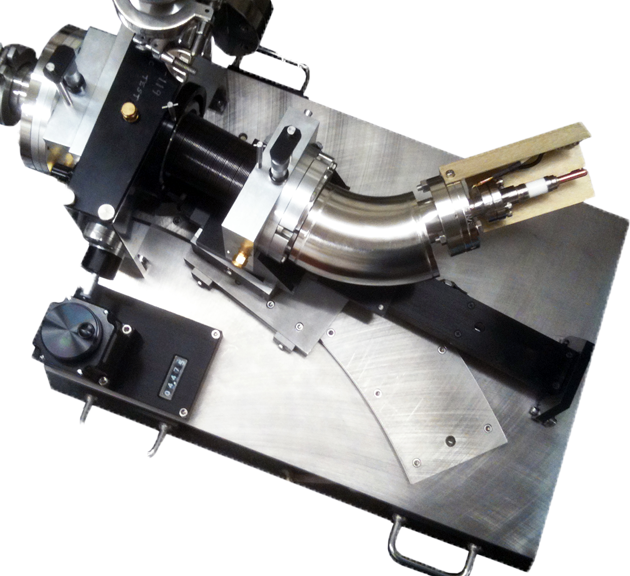 Spectral broadening, self-shortening of the IR pulse and HHG are realized in a single stage, reducing the cost and experimental effort for easier spreading of attosecond sources. We observe continuous XUV spectra supporting IAPs, emerging directly from the filament via a truncating pinhole to vacuum. The extremely short absorption length of the XUV radiation makes it a highly local probe for studying the elusive filamentation dynamics and in particular provides an experimental diagnostic of short-lived spikes in laser intensity. The excellent agreement with numerical simulations suggests the formation of a single-cycle pulse in the filament. Abstract: We have spatially and spectrally resolved the high order harmonic emission from an argon gas target. Under proper phase matching conditions we were able to observe for the first time the spatial fine structure originating from the interference of the two shortest quantum paths in the harmonic beam. The structure can be explained by the intensitydependent harmonic phase of the contributions from the two paths. The spatially and spectrally resolved measurements are consistent with previous spatially integrated results. Our measurement method represents a new tool to clearly distinguish between different interference effects and to potentially observe higher order trajectories in the future with improved detection sensitivity. Here, we demonstrate additional experimental evidence that the observed interference pattern is only due to quantum-path interferences and cannot be explained by a phase modulation effect. Our experimental results are fully supported by simulations using the strong field approximation and including propagation. Abstract: We present a compact extreme ultraviolet (XUV) source based on high-harmonic generation (HHG) at 2.4 MHz pulse repetition rate driven from the compressed output of a mode-locked thin-disk laser (TDL) oscillator. The system generates very high peak intensities, which enable highly nonlinear frequency conversion reaching VUV/XUV energies. These sources significantly increase the signal-to-noise ratio and reduce measurement durations in many fields such as condensed matter physics. The pulse repetition rate is increased from kilohertz to megahertz with high average photon flux, while keeping the pulse energy sufficiently low to avoid space charge effects. The system uses a semiconductor saturable absorber mirror mode-locked Yb:YAG TDL delivering an average power of up to 70 W with subpicosecond pulses, which are efficiently compressed to sub-100 fs in a simple, single-stage compressor based on a Kagome-type hollow-core photonic crystal fiber. Focusing into a high-pressure xenon gas jet, we generate XUV radiation with up to >5 × 10E7 photons∕s on the 19th harmonic (23 eV). 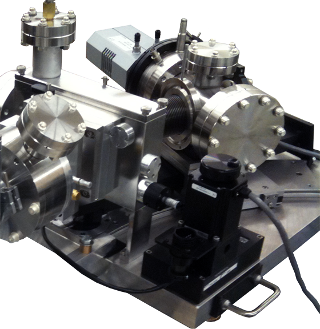 This HHG system is very compact, has low-noise performance comparable to standard ultrafast low-power laser oscillators, and provides a new tool for the study of attosecond dynamics in condensed matter physics.